Most Christians know that Jeremiah didn’t have a whole lot of good things to promise the Children of Israel. To be honest, he’s kind of known as the doom and gloom guy. I mean he wrote a book called Lamentations. What more proof do you need? Don’t lose heart. In the midst of the bad news there is a lot to be learned. I have been studying Jeremiah for several weeks and here is just one little gem that I found. As someone interested in words I thought the choice of the word “valiant” was really unusual. 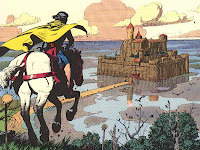 Valiant conjures images in my mind of knights riding off to slay dragons, quests, swords and battles. Seemed like a pretty strong word for the context and so I decided to look it up. Enquiring minds want to know! 1. To be strong/mighty. Okay this is sort of close to my own mental definition. I can deal with it. 2. To act proudly. Ooh now things are getting interesting. We shouldn’t act as if we are ashamed of truth. We should proclaim it proudly. Why not wear our faith on our sleeves? Why try to blend in with the world? Do we think that we can ambush them into salvation? What if they ambush us instead? Sometimes we are pretty good at talking truth to one another. It’s where we are comfortable. But do we hold our heads up high when it comes time to defend our convictions out in the world? We ‘re not just supposed to talk truth among ourselves. 3. To confirm. Hmm this one got me thinking. If we insert this instead of valiant, it reads: “they did not confirm the truth in the earth.” God is really starting to heat things up! You see He doesn’t just require lip service! He wants our actions, the way we live our lives, to confirm what we say with our mouths. I don’t know about you but I’m starting to feel some conviction. So fellow soldiers for the Lord, how will you wield your sword and show yourself valiant for the truth? Because of my husband's ministry, I have regular opportunity to meet Muslims who have converted to Christianity and risk their lives daily not only for their faith, but also to proclaim the truth to other Muslims. Recently we met a former terrorist who is now speaking up and proclaiming the gospel. My son asked him how he is alive. He told my son, "Men don't decide when I die. Only God decides when I die." That is valiant. Thought provoking post, Lisa. I think it comes down to taking risks for God. What that looks like is probably different for each of us. Building friendships and sharing our faith, our stories, the opportunities God places in our paths, are all ways of taking risks for God. Lots to think about, Lisa. I think, for me, it's very hard to be verbally valiant. So I try to live the truth and write the truth, and maybe someday I'll be able to stand up and speak valiantly. Good words to chew on today, Lisa. I like going behind a word and looking at it from a different angle. This is a much bigger word than I realized. Not feeling very valiant today. I can only pray I can at least open my mouth and let the words come out when needed. Great post, Lisa. I do not perceive myself as a valiant person, because even when I stand up for something (faith-related or not), I go home needing reassurance. I need to rely on God for my reassurance, and my words. Thanks for all the comments, ladies. Jill, I think you're right. Being valiant will require different things from each of us because we all value different things and fear different things. Susie, I think you're valiant. Needing reassurance later doesn't detract from the fact that you did the right thing under pressure. I'm thinking of the story where you took your baby to see the lady dying in the hospital. That took courage to step beyond all the disapproval from others and show God's love. Deb, I think willingness to be used when the time comes is all that anyone can ask. Suzie, a life lived for truth is confirmation of the word. It's a more powerful witness than anything we can say with our mouths. Sorry I got here so late all. Thanks for keeping the discussion going without me! Thanks for a new look at this piece of the Bible. I must admit, I don't always act in a valiant manner. But this gives me something to think about and strive for. Jen, I don't know anyone who gets it right all the time. We all just do our best with where we're at. Lisa, I like Jeremiah for this very reason. He STOOD. He stayed. When that king took the warning message Jeremiah had spent who knows how long writing, cut it into shreds and burned it, Jeremiah didn't quit, he just rewrote the thing. That's valiant to me, that never give up quality!